by Mick Ward. This piece first appeard in Irish Mountain Log in 1992. Mick has been climbing for 38 years and has just written a book called How to climb 3 grades harder. Much has been written and much will continue to be written about the Nineteen Sixties. In a remarkable century it was an exceptional decade. Before demographics were widely known, a huge demographic shift occurred - the post-war baby boom triumphantly came of age. Our rite of passage was a birthday party par excellence, an explosion of energy, a riot of outrageous colour. Of course there were real riots also - Paris, Belfast... And there was Vietnam. Our coming of age was both light and dark. But, through light and dark, few of us who were involved, however peripherally, remained unchanged. And those who were changed could never quite forget. Years later, the shards and fragments of personal history would be pored over and re-examined as we strove to answer the critical question of our youth, our coming of age - What happened? I started to climb about 1967, in disused quarries outside Belfast and on the walls of an abandoned country cottage beside my boarding school in Newry. Through necessity I climbed alone; through the same necessity, my climbing was self-taught. By 1969 I had graduated to the Moumes and Donegal and Wicklow. What follows is a fragment only a tiny shard of what happened in the Sixties, which I still sometimes re-examine, to answer that same fundamental question - What happened? I was too young to understand then; perhaps some kind of understanding will come now. And, although I was a minor and peripheral character in what follows, it was probably because of this that I was most affected by what happened. I can't remember hitching from Belfast to Dublin but suddenly it was early evening and I had lingered too long on the sunlit lawns of Trinity. The bus to Wicklow left at half-past seven and I must be on it. From Saint Stephen's Green to Roundwood to Laragh, that ancient bus carted me off into the soft Irish evening with only my climbing dreams to cherish and enfold me. What I would climb on the morrow! You smile. My childhood Severes were paths to heaven which I tortuously followed in a state of grace. I left the bus at Laragh, which then reminded me of Zhivago, and hiked the last stretch up the hill to the Glendasan hut. Barry O'Rynn, innkeeper and sage,was, as ever, in residence, yet another fat paperback perched on the table in front of him, pipe grimly clenched in his teeth. The light of debate was in his eye; his keen, questing intellect was tempered only by humanity. He was a man I liked, admired and went in awe of. Although his own climbing days were behind him, he had left a few select mementoes on which, it was rumoured, strong men had struggled. The sole other occupant of the hut was a young, red-haired, vividly freckled lad called Colm, who had blithely wandered in from and for the night. Colm worked for one of the big Dublin daily papers and lived to travel the length and breadth of the country, playing the tin whistle at music festivals. He was for the moment in a way which, even then, I found entrancing. Finding himself unexpectedly in a milieu of climbers, climbing he would go. As my own friends were not due to arrive until the following evening, I promised to take Colm up on Camaderry, the very next day. And so, on a gloriously sunny Saturday morning in midsummer, at the very end of the Sixties, Colm and I walked past the Round Tower and up by the twin lakes. Glendalough was almost deserted, just a single blue Mini in the car park, two men in their early twenties chatting by it. We passed the upper lake which might have have been bottled Guinness, the merest fleck of grey froth on its' smooth, black surface,and up, past the painted red stones, to Base Camp. On a previous visit to Glendalough, I had much admired Sean Rothery's lovely little route, Facilis Descensus and had even, courtesy of Doug Milnes, been taken up it. That day I wanted to lead it. Colm paid out the rope (his first belay ever!) and I moved cautiously up the initial easy wall to the narrow ledge beneath the crux. Here, a tape was looped around a slim, grey flake, backed up by a brass hex, machined by Tom Wouife at UCD. Protection to stop an elephant! Elephants aside, and to my utter chagrin, I funked it. After much upping, downing and general fumbling, I circumvented the crux by miserably clambering up the vegetation by its side. Colm to my considerable surprise, shot up the whole route. A tribute to insouciance? Perhaps. Certainly a fine effort for his first climb. We came back down to Base Camp where I disgustedly flung my neatly coiled Viking Number Four rope on to a hefty granite slab. Too late, the crunch of boot upon stone announced the arrival of strangers and probable voyeurs to my sin. The three arrivals stopped, lowered heavy sacs. It was the two from the Mini, one sturdy and curly-haired, the other tall and thin. With them was an older, thick-set man. The first and last were Southerners, the tall one a fellow Northerner. Bruce, they called him, asked me what we'd done, politely commenting on what a fine route Facilis was. On my wry admission of my slight (!) deviation from the crux, he remarked with singular tact, " Well never mind.. I'm sure we've all done that in our time..." Cheering and charitable words indeed. Embarrassed as hell, I couldn't help but warm to him. Colm and I sat awhile and watched avidly as Bruce and Paul (the curly one) nonchalantly proceeded to unload more climbing gear than I'd ever seen in one place before. When I timidly ventured that they seemed extremely well prepared, Paul smiled gently. "You need to be well prepared nowadays... "
Paul and Bruce geared up with slow deliberation. Conversation was sparse, functional. The then magical words, "new route", uttered just once, sent a tingle of excitement through me. Even Colm sensed that something out of the ordinary was afoot. By degrees, the sun rose higher in a cloudless sky, until the whole valley was bathed in heat. The lakes were lost in a filmy haze, sweat trickled down my legs, from thick corduroy breeks to itchy woollen stockings. Hundreds of feet above, Paul was impaled upon a seemingly blank, vertical wall, a tiny insect, now motionless, then tentatively probing, now motionless again, nearing the arching rim with unbearable slow- ness. Hour imperceptibly slid into hour; the very sense of time passing seemed to slip away from us. My struggles on Acorn, that baking hot afternoon long ago, owed far more to enthusiasm than technique. I flailed and flailed at the bayonet crack until the evil angle finally relented. Just when I thought I'd got it, my right boot stuck fast. In pure and utter despair I wrenched frantically. Just then, Colm shouted up, his voice hoarse and quivering with emotion, "Jaysus, Mick, there's a woman down there and she's got no top on!" and she's got no top on!" Nineteen Sixties Ireland. White flesh; Catholic Mass. Dark confessional; mortal sin. Defying every law of off-widths and lumbar suppleness, I stretched round to searchingly gaze down the length of Glendalough. With infinite poise, which I shall never forget, she emerged from the giant boulders far below, with not a backward glance, walked slowly down the path that leads through the valley floor. A tiny, gamine figure, vanishing into the film of haze. A girl whom I had not met, probably never would, could only helplessly wonder about. Above, Paul still clung to the bare stone. I marvelled at his stamina, his terrible ambition. He was where I yearned to be, a place separate and apart, beyond doubt or yearning. More time passed and something of note happened. Jimmie, sore and red as beetroot from the burning sun, slowly sat up, reached in his sac and produced a pair of rock boots. He stood pensively at the bottom of Facilis and moments later was up it. Then Acorn, then the wall in between. My several hours of valiant effort were neatly eclipsed by a few carefree minutes of effortless ease. And effortless ease it was, make no mistake about that. Older and thick-set he may have seemed but Jimmie McKenzie moved with a sureness I had not encountered before and would not see again until, five years later, Jim Erickson balanced on smooth Cromlech walls. My God, but the man could climb! But would he climb with me? That was the question. For Colm had been travelling on a kind of high-pitched nervous energy which, on Acorn, had finally expired. And, although tired, I was still mad keen. Roped, Jimmie and I could do one more route. All I had to do was ask. "Fine," he cheerfully agreed, with a lopsided grin, "We'll do Scimitar then..."
For those of you who have not been there, the main buttress at Glendalough rises perhaps two hundred and fifty feet in a great sweeping triangle of rock that tapers ultimately into a slim blade. That blade is Spillikin Ridge, then Ireland's hardest and most famous climb. Scimitar Crack is an eponymously shaped long curving quartz vein in the grey granite. It runs the full height of the crag. The Scimitar rears upwards to become vertical at its crux, high by that slender, exposed blade. There my mentor from the Mournes had failed and fallen, outfaced and outclassed by technicality and sheer exposure. Now it was my turn. Jimmie did Scimitar 'the modern way', effortlessly running the first two pitches of Spillikin together into a long runout up to Spillikin Ledge. As I made to follow him, from high above, after many hours of unremitting toil, Paul lunged for the rim of his vertical prison. And got it! Bruce and he shouted as one/ their joint cry of wild jubiliation ringing out across the evening crag and down the long swell of valley below. Little did any of us then guess how brief and fleeting would be their triumph. Following Jimmie was, for me, movement into another realm one of which I had hitherto only dreamed. Before my standard was mostly V. Diff and Severe the very occasional V.S. For a sixteen year old boy in Ireland then even that was unusual. But inspired by Jimmie's graceful economy of movement I floated up the first pitch, at Hard Severe steep but with good incut fingerholds. Even the next pitch/ then graded Hard V.S. presented little difficulty, steeper and with much smaller fingerholds yet still sharp and incut. In minutes I stood with Jimmie on Spillikin Ledge in a state of utter disbelief. My V. Diff bumblings might have belonged to another time as I stood beneath the crux of the hardest climb in the country. But from Spillikin Ledge we went another way spanning out left across the crux of Fanfare and moving up in turn to the crux of Scimitar. The crux of Fanfare is the first move off Spillikin Ledge a long stride onto a tiny granite nick. In the gentle evening gloaming Jimmie with infinite skill and patience made the move three times in slow succession so that I could memorise the sequence. Then he was gone.. And suddenly the ledge was bare and lonely, the quiet evening no longer gentle but faintly menacing. The rope ran out quickly, then stopped. A sharp click as he clipped the peg by the crux. Then it ran out once again, without pause as he moved back high above to finish atop the great blade of Spillikin Ridge, overlooking the whole valley. The rope came tight. Carefully, I undipped from the belay and started to follow. And as I stepped out left from the ledge, on to the tiny granite nick, the crux of Fanfare, in pale imitation of Jimmie's gracefulness, I felt... I felt more than at any other time in my life, before or since, that I was climbing free of whatever was my past and moving into a future, unknown, indeterminate, which would only be revealed by questing touch. In those few moments I glimpsed the true meaning of encounter. It was a lesson that I would have to learn and agonisingly relearn, again and again, in the pain and misery of the years to come. My concentration was utter, as my Charlie Chaplin boots scraped at the nicks and edges in the quartz vein. The silence of the darkening valley and the deep emptiness of space were all around me. climbing beyond my limit, where grades and limits no longer mattered, I moved up the quartz vein, up to where it steepened, turned, up, past the peg and the crux, up, tiring on the layback crack, up, finally with unexpected balletic grace, across the great ridge of Spillikin, on the prow above the valley, to the ledge where Jimmie patiently waited. I looked at him. There were no words. He understood. Five people climbed on Camaderry that day. Paul, Bruce, Jimmie Colm, myself. In very different ways all of us knew a kind of triumph. The next morning Colm was gone as easily out of my life as he had entered it. I never met him again. Although I came across Jimmie the odd time since, the curse of shyness kept me apart, and I'm not even sure that he remembered me, a young boy who loved climbing with a love that was too intense. The following day, Bruce took me aside and swore me to secrecy about their ascent. By then, I'd already blurted it out to Doug Milnes. Bruce said that he didn't mind Doug knowing but it was vital that McHugh didn't know. Emmet Goulding had fallen from the last move back in 1963 so, Bruce suggested, it wasn't really that much of a first ascent, after all. But Paul and he would let McHugh climb it as a first ascent, in ignorance, as their little joke. What none of us then knew was that McHugh had watched the entire ascent from binoculars across the valley, the day before. That Sunday he walked up Spillikin Ridge, the hardest route in Ireland, like it was a staircase, laughing and chatting all the while, to show how easy it was. Leaving his powerful calling card on the crag. My new found confidence - after my first Hard V.S. - lasted a month and died on the protectionless friction ramps of Ploughshare in Lough Barra, where Charlie Chaplin boots proved inappropriate footwear. Although, in years to come, I would wear those same old tattered boots soloing in the Mournes, mocking the fates that so steadfastly refused my own calling card. Paul McDermott and Bruce Rodgers died in the Alps ten days later, on the Sentinelle Rouge. Always I will see Paul's gentle smile and hear him say, "You need to be well prepared nowadays..."
And my lady of the valley? She was Liz, engaged to Paul. We met that autumn at the Bloat House and shared a battered teapot of punch. Somehow we realized who we were. Such pain, such pain... Although only a few years older than me, she was already no stranger to death. Her companion wanted to know why people climb anyway, but there are, of course, no real answers. We never met again. 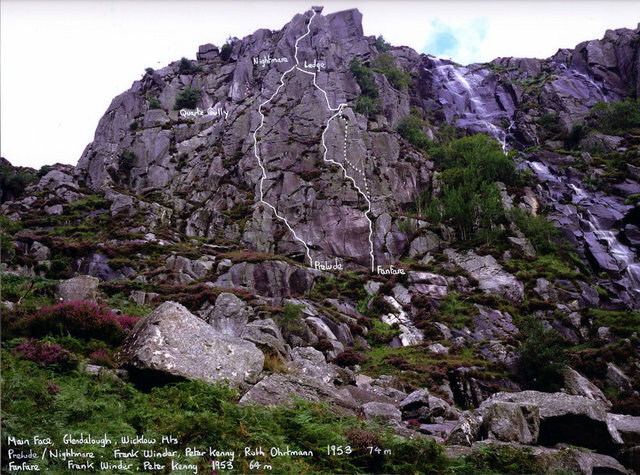 On a lovely midsummer day in 1969, five people climbed on Camaderry in the valley of Glendalough, amid the Wicklow hills. Of the five of us probably I am the only one for whom it still matters. Something happened that day which meant that never again would I be content to live in the prison of limitation. The years to come were hard and bitter but they had to be lived. For the rest there is only memory.